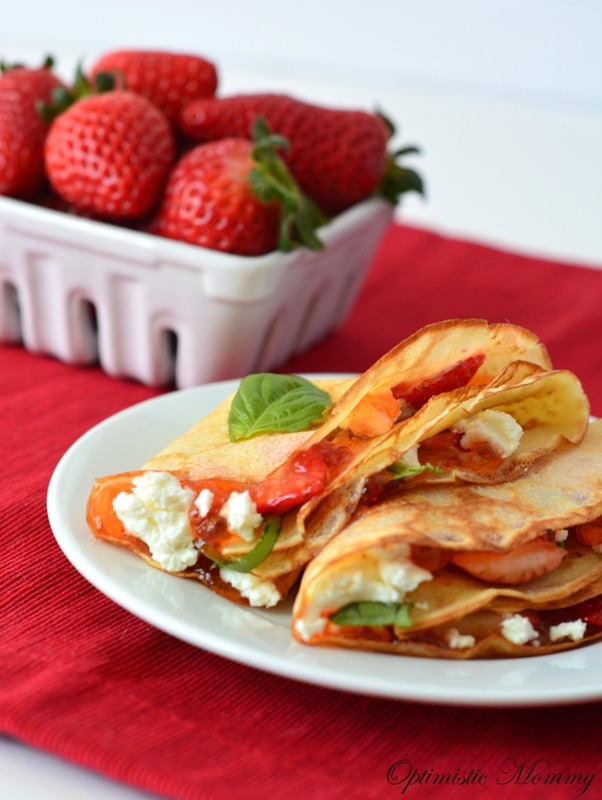 Start your day with some delicious strawberry crepes with goat cheese and basil! With it winter here in Ohio, I am craving some summer and sunshine. I am tired of snow and negative temperatures! 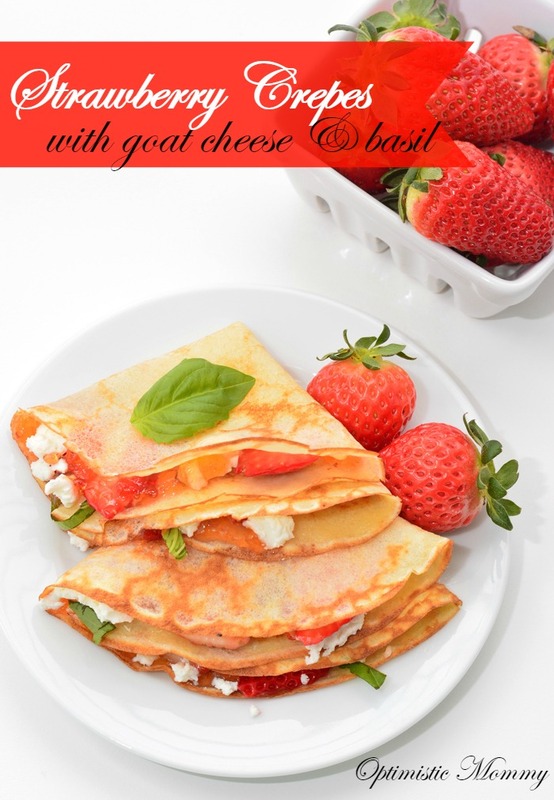 To brighten up the dreary days, I am sharing these delicious recipe for strawberry crepes with goat cheese and basil! 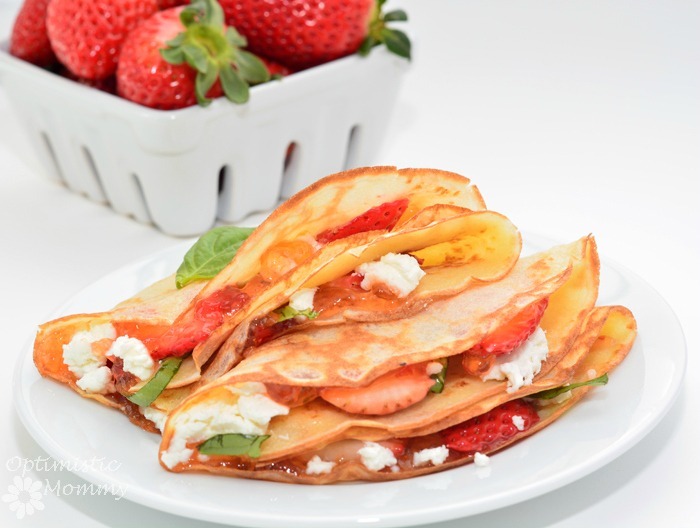 These strawberry crepes are sure to be a huge hit with the entire family. Whether for a brinner (breakfast for dinner), Saturday breakfast, or a Sunday brunch, the combination of the strawberries, goat cheese, and basil is absolutely delicious. If you aren’t a fan of the red pepper jelly, you can always substitute strawberry jam, homemade or store bought, as well. I hope to find a place this summer to go strawberry picking. It is an adventure that has been on my Bucket List for some time, and I know my daughter would have a blast picking them! Whether it’s winter where you are, or it’s now spring or summer, these strawberry crepes are sure to be a hit with your family or even at your brunch party! I can’t wait to make these again the morning of my daughter’s birthday next month! Mix the eggs, milk, water, butter, and vanilla extract together. Add the flour, sugar, and salt to the wet mix. Pre-heat a small non-stick skillet to medium heat. Add 1/3 crepe batter mix to the heated skillet. As quickly as possible, rotate the skillet to thin out the crepe and make it larger in size. Each crepe should be cooked about 1 minute per side. Repeat until there is no mix leftover. 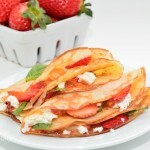 Spread the red pepper jelly on the crepe and top with strawberries, goat cheese, and basil to taste! Fold in half or quarters, depending on your preference. 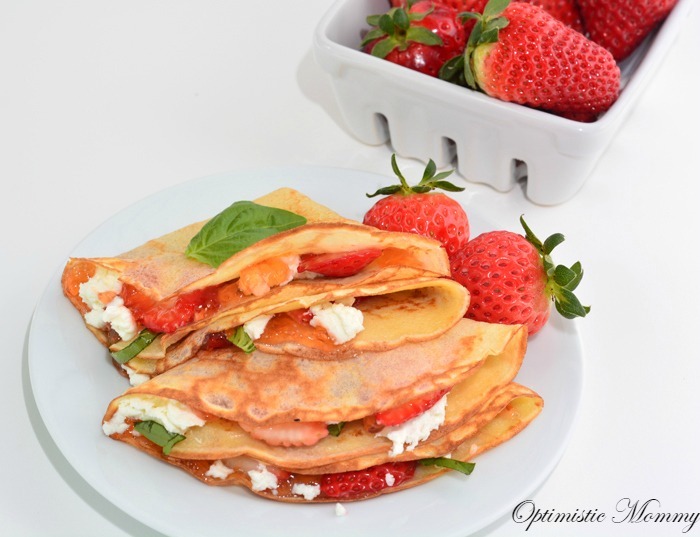 Do you think your family would enjoy these strawberry crepes? Don’t forget to see what other recipes I have shared! OMG this post takes me to heaven. I’m renewing my wedding vows in June and my one MUST HAVE was the local food truck crepe lady. She wasn’t cheap but I bought her out for the night! This looks delicious. Your Ohio winters are much like ours here in Michigan. I am also so over cold and snow even though we didn’t get as much as we did last year. We’re planning a bridal shower for our youngest daughter in April and a crepe bar is on the menu. This post is right on time! I grew up strawberry picking every summer – it is such a fun experience! I’ve not been able to find any where I live now though 🙁 Thank you for sharing these on Weekend Bites, I’m featuring it on today’s party! G’day and congrats on getting featured via Gator Mommy Reviews These look delish and hope you will like to hop over to my Say Gday Party too! This sounds so good! Thank you for sharing the recipe with us. These look amazing. I took down the recipe, and cannot wait to try these. Hubby will love these.